Gala Bingo is hugely popular throughout the UK and now thanks to this app, you can enjoy playing bingo while out on the go. 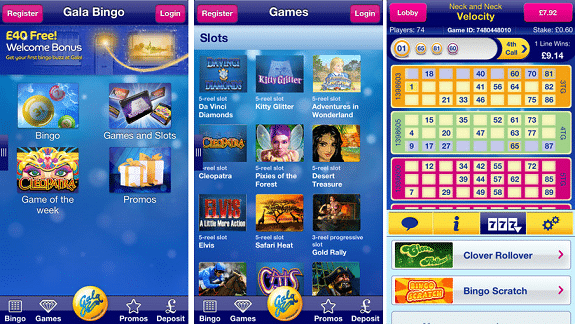 The app offers lots of fun games, with 21 bingo rooms and over 200 slots, as well as a handful of games exclusive to Gala Bingo. If you’re a fan of what is one of the UK’s biggest bingo sites, you’ll definitely want to give the app a try. The Gala Bingo app is available on iOS and Android devices. The app is 37.1 MB in size and if you’re downloading it to an iOS device, it requires iOS 8.0 or later. The app should run smoothy on all iOS and Android devices. The Gala Bingo welcome bonus is a 300% match bonus that new players can claim. The bonus is a cash prize of £30 that you can claim once you’ve signed up to Gala Bingo, deposited a minimum of £10 and spent £10 on bingo games. The bonus is set at exactly £30 and this will be credited to your account’s bingo bonus section. You must be 18 years or older to take part in this promotion and you must live in any country where Gala Bingo accepts customers. You must also be a new player and not have any other accounts. Once you’ve created your account, you’ll have 30 days to claim the welcome bonus. Once you’ve received your bonus funds, you’ll have seven days to use them. They have wagering requirements of 4x before you can withdraw bonus winnings. The bonus money can only be used to buy bingo tickets. The Gala Bingo mobile app certainly has a lot to offer. There are over 20 bingo rooms, as well as hundreds of games, including slots, casino games and scratch cards. What sets this app apart from others is that it has some great non-gaming features as well. There’s the Happy Hub where you can read fun and amusing blogs on all sorts of topics, as well as Gala Bingo news and chat – there are even videos you can watch. The app also has a Clubs section which helps you find your nearest Gala Bingo club and shows what facilities it has. How can I play bingo games using this app? Once you’re on the homepage, you’ll see a pink Play Bingo Now button that takes you to the bingo lobby. Scroll down the lobby to see what bingo games are available and how much tickets cost; you’ll also see how many players are currently signed up to play the game and what the prize is. Tap on Schedule to see when each of the bingo games is going to be played. How can I manage payments using this app? Tap the pink button at the top right of the home page to open up the cashier section. You’ll see your current cash balance and total number of Happy Points. Below them there’s a dropdown menu of options available. The first one of these is Deposit and Withdraw is the fifth one down. To make a deposit or withdrawal, tap on the one you want and simply follow the instructions. There doesn’t appear to be any other apps available from Gala Interactive Limited. There doesn't seem to be a mobile-specific bonus available on the Gala Bingo mobile app. All of the promotions listed on the app are exactly the same as the ones listed on the website. Gala Bingo certainly knows how to keep players entertained and its mobile app does a great job of doing just that. The app has well over 200 games available in total, with plenty of bingo rooms to keep you busy, as well as lots of slots and casino games. There are plenty of other exciting features as well on the app. Head to the Happy Hub to read up on the latest Gala Bingo news or read fun and quirky blog posts, chats and articles about lots of non-bingo topics. The app also has a section where you can find out about your nearest Gala Bingo club for if you ever want to try playing bingo in a proper bingo hall. There’s also a VIP scheme that rewards loyal players with special promotions, bonuses and offers. The only downside to the app is that finding contact details isn’t as easy as it should since you have to go through the Help Centre to find them. The app is bursting with content and has so much more to offer than just bingo, so it’s highly recommended that you download it and start playing today.